What Activities for Childrens Books Are Needed for Improving Creativity? Although there are many activities for childrens books from which parents can choose, your selection depends upon the contents of each book as well as the age of your child. As well, there are interactive online books for kids where kids are provided a wide variety of activities. For childrens books which already contain activities, your job is simple. But you're probably visiting this page to get inspiration to create your own activities for the books your children read. The following ideas for activities are for children ages 6-18, as that is the age group I write for and am most familiar with. Let's say your child is reading an adventure book about a space traveler who discovers a new planet. (Remember, this is just an example to jump start your brain). Ask your child a series of questions with the intention of discovering what she most liked about the book. Was it the exciting adventure? Traveling to outer space? Living in a space ship for awhile? Being the first child to navigate a space shuttle? You have lots of options regarding the questions you ask, and the questions form the foundation for the activities for childrens books that your child eventually does. After she's answered the questions, have her write her own story about an adventure she would like to go on if resources were unlimited. In other words, you're trying to ignite her into thinking possibilities, not practicality at this stage. If she balks about going on her own adventure, help her by asking who she might like to go with. What she'd like to eat. What clothes would she wear? How much clothing and accessories could she actually bring along? When she's answered the questions and is excited about her adventure, have her describe a brief purpose for the adventure. Nothing fancy, something simple, so she begins to see that adventures can have purposes as well as other activities. For childrens books she really likes, she might write a thank you letter to the author and describe briefly her own adventure, suggesting the author consider adopting it as a story line for a childrens book. Your main job is to offer inspiration empowering children to be creative thinkers, looking at the world of possibilities and to have fun while doing so. If your child likes to draw and illustrate, then have her create drawings to go along with her story. Here is what one author has done to inspire writing and drawing activities for childrens books. Perhaps you can then turn the pages into a small book, which your child can proudly share with friends and family. Your child can interview a half dozen people or so to discover their favorite adventure. This deepens communication and social skills. Who knows what fascinating discussions might evolve from these questions. One thing I'll guarantee you is that if your child asks older people about the adventures they never took, she'll soon discover most adults have regrets about things they didn't do with their lives. This can inspire your child to live her life to the fullest and to pursue her dreams. Find any of the above ideas useful? To be informed when KidsPower Alerts, my ezine for parents seeking inspiration empowering their kids, offers new resources, info or ideas, complete the simple sign in form below. I promise to use it only to send you Friendship Power Alerts. Let's say your child decides she wants to write a small childrens book. Here are suggestions for words for writing childrens books that are useful as your child explores her love of writing. Children who like to write need to be encouraged. At early stages of writing, ideas are far more important than grammar. Then if she also like to draw, she can add pictures to the words she's written! 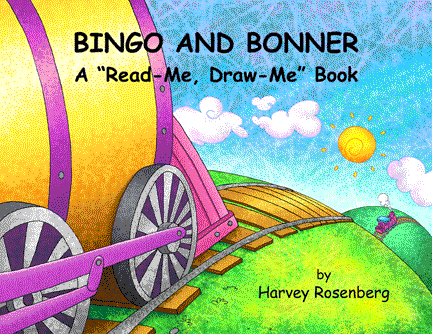 Here's a sampling of what I've done to add extraordinary activities for childrens books with a Unit Study on Friendship that accompanies Bingo and Bonner, A Read-Me, Draw-Me Book. Here are free samples of printable coloring and drawing pages from the picture book story (without the pictures)from Bingo and Bonner. Kids love drawing the pictures based on their understanding of the words on each page. This is highly creative and supports your child's needs to express creativity, one of our most valuable lifetime assets. The information and art found on Activities for Childrens Books is the property of Childrens Educational Books.